To start, you will want to have on hand either some healthy milk kefir grains or water kefir grains. The first recipe will focus on using healthy, active milk kefir grains that have already been producing milk kefir on a regular basis. If you want a completely dairy free option, read on to the second recipe to see how to make coconut milk kefir using water kefir grains. The third recipe shows how to make coconut milk kefir from prepared water kefir or prepared milk kefir. This option allows you to make coconut milk kefir without having to use your grains in the coconut milk. For the first two recipes that use kefir grains, gather together your ingredients, 2 cups of coconut milk (learn how to make coconut milk here) and 1 tablespoon of milk kefir grains (or 2 tablespoons water kefir grains). You will also need a glass jar to set your coconut kefir to culture in. The jar should be large enough to hold all of the coconut milk, the kefir grains and have at least 2 inches of headroom leftover. Place your grains in the bottom of your glass jar then pour the coconut milk over the grains. Cover lightly with a cloth and rubber band or place a loose lid on the jar. Set the coconut milk aside and let culture for 24 hours. At the end of 24 hours, strain the grains out of the coconut milk kefir and set aside. Pour the coconut milk kefir into another container in preparation for use. Put the kefir grains back into the culturing jar and pour in more coconut milk, or if you are on a feeding phase, dairy milk. When using prepared kefir, simply add ¼ cup of prepared water or milk kefir to your 2 cups of coconut, stir, cover and let sit 24 hours. Your coconut milk kefir is now ready to be used. Drink it straight, blend it into a smoothie, use it in recipes … the possibilities are endless! Place the milk kefir grains and the coconut milk in a glass jar. Lightly cover and set on the counter for 24 hours. At the end of 24 hours, strain the grains out of the coconut milk kefir and use. Feed the grains to keep them healthy and propagating. Place the coconut milk and the water kefir into a glass jar with at least 2 inches of extra room at the top of the jar for expansion. Loosely cover and let sit for 24 hours. After 24 hours, strain out the water kefir grains. Your coconut milk kefir is now ready to be used. Place the coconut milk and the prepared water or milk kefir into a container. Mix the coconut milk with the prepared kefir then cover and let sit 24 hours. After 24 hours, enjoy your coconut milk kefir. This recipe is actually great for any non-dairy milk, almond, soy, etc. Follow any of the recipes as listed above, just substitute in whatever other milk you want to use instead. Coconut milk kefir, any kefir for that matter, tastes sour. Similar in taste to plain yogurt(not exactly the same but close in terms of tartness). If you do not like plain yogurt, chances are you will not like plain kefir much either. That’s ok, you can still consume coconut milk kefir and get its amazing benefits. Add maple to sweeten it or use it in smoothies to make it more palatable. Your milk/water kefir grains are living creatures. If you forget to feed them you can kill or harm them. When making coconut milk kefir, you are essentially starving your grains of the food they need. This is ok for a short period of time (1-2 batches) but, if you want to keep them alive, you will need to put them back into their normal food source. Milk kefir grains eat dairy milk (cow, goat, sheep, etc) and water kefir grains eat sugar water. Get into a routine if you want a constant supply of coconut milk kefir, 1-2 batches coconut milk kefir, 1 batch dairy milk kefir and so on. If you want to continue to ferment your kefir to continue removing sugars, strain out the grains and leave it on the counter for longer. It is always a good idea to use extra grains for culturing anything other than their normal food. This way, if something bad happens you still have your main backup. Sometimes your coconut milk kefir may be runny. This can be due to changing the kefir grain’s food (for example, from cow’s milk to coconut milk). Continue culturing your kefir, removing the grains after 24 hours each time. Thick or runny, as long as the kefir is not pink is visibly moldy, it is fine to use. Even if the kefir is yeasty and you do not like the flavor, you can incorporate it into recipes and use it that way instead. Kefir is a great substitute for buttermilk or sour cream in recipes, of course when using coconut milk kefir, you will also add in a coconut note so keep that in mind. As the kefir grains ferment the milk they produce carbon dioxide. If you do not leave some headroom, the finished kefir can expand out of the space of the jar you put it in. It is a good idea to fill jars to no more than ¾ full. 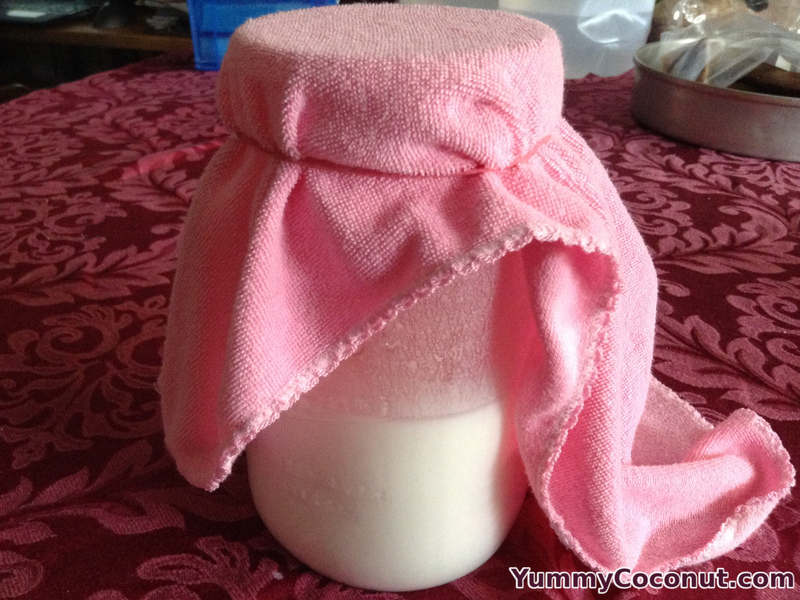 It is a good idea to use a loose fitting lid or cloth to cover the kefir while it is fermenting. It allows the gas to escape out of the jar while keeping bugs and other things out. If you use a fermentation vessel with a tight lid, it is a good idea to burp the kefir about every 24 hours to make sure you don’t have any surprise explosions. Only use glass, wood or stainless steel with your kefir grains. Metals other than stainless steel have been thought to kill grains over time. There is also some thought that silicone may cause the grains to die over time. Kefir is high in acid and as such may leach toxins from plastic, it is better to avoid plastic if you can. Before you decide to culture your coconut milk into kefir, taste it. If you do not like the taste prior to fermenting it, there is a good chance that you will not like it after it is kefir either.